If you ask some people what they think about the tomato, they might tell you that it is not nutritionally valuable. However, one look at tomatoes' beautifully bright colors can tell you that they are loaded with beta-carotene. But that's just the beginning. It has been noted that people who live in the Mediterranean area, where tomato consumption is one of the largest in the world, have a lower rate of some cancers. Research has shown that, along with beta-carotene, tomatoes are rich in other phytochemicals and carotenoids, potent antioxidants. Among these are lutein, lycopene, coumarins, flavonoids, phenols, and terpenes—elements extremely important in the fight against cancer. Tomatoes seem to be especially effective against pancreatic, stomach, and lung cancers. Where lung cancer is concerned, studies have indicated that once it has been diagnosed, an increased intake of tomatoes can extend survival rate. 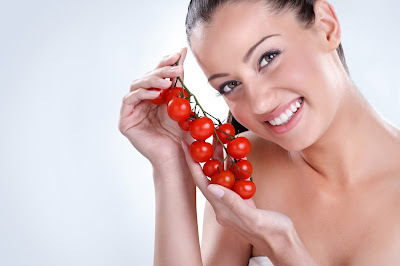 The good news for women is that tomatoes seem to fight off cancers that particularly affect them. Cervical Cancer. A study at the University of Illinois at Chicago showed that women with the highest blood level of lycopene had five times lower risk of developing precancerous signs of cervical cancer than those women who had the lowest blood levels of lycopene. Tomatoes are very high in lycopenes. Breast Cancer. Because of the high levels of vitamin C, tomatoes are a strong weapon against breast cancer. Studies have shown that vitamin C helps fight that particular disease by inhibiting tumor growth; neutralizing cancer-causing elements, such as nitrites (preservatives) and nitrates (found naturally in vegetables and water); and by boosting immunity, helping the body to naturally fight off cell abnormalities. 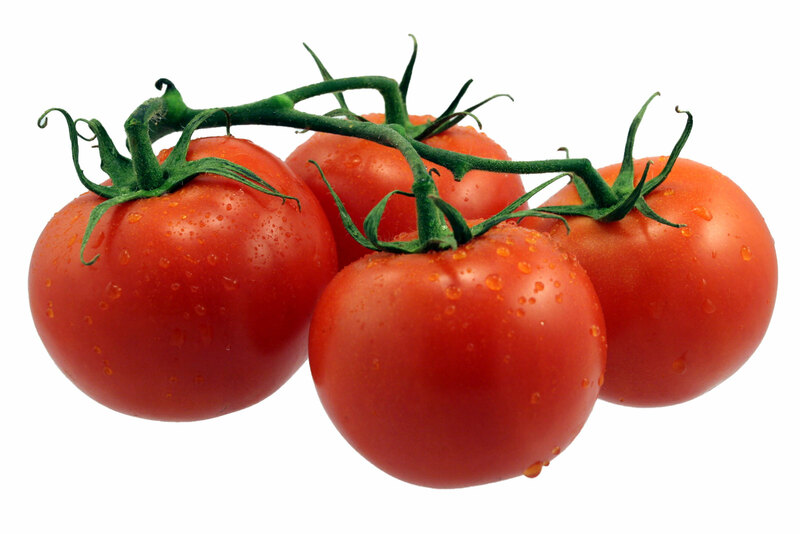 Tomatoes are an excellent source of vitamins C and A and a good source of the B vitamins . One medium tomato (about 4½ oz.) contains 24 mg vitamin C, which is about 40% of the U.S. recommended daily allowance, and 76 RE (retinol equivalent) vitamin A, which is about 20% of U.S. RDA. That same medium tomato has 30 mg phosphorus, 273 mg potassium, 6 mg calcium, 2 g dietary fiber, and 1 g protein, as well as a bit of vitamin E, thiamine, riboflavin, folic acid, niacin, iron, sodium, magnesium, and zinc. Tomato juice and tomato paste have higher concentrations of some of these nutrients. Being about 90% water, tomatoes are low in calories and fat and, consequently, are part of a healthy diet, reducing the risk of heart disease and high blood pressure. Like anything else, tomatoes can have their downside. The following is a list of problems some people have been known to experience. —For people who suffer from diverticulitis, tomato seeds may be a problem because they are small and numerous. —Because tomatoes contain acid, they may induce heartburn for those who are prone to it. —Sufferers of Crohn's disease should avoid tomatoes; they may induce symptoms. —For some, digesting tomato skin may be difficult. —Some people get allergic reactions or irritation from too much tomato consumption. —Tomatoes have been connected to arthritis as a joint irritant (this goes for other members of the nightshade family (eggplants, peppers, potatoes), as well. —As a member of the deadly nightshade family, the leaves and stems of tomatoes are toxic and have been known to kill livestock. Keep your household pets from munching on them. Originally from Peru, Europeans took a long time to like tomatoes. Even though the Aztecs taught the conquering Spaniards different ways to prepare them, people were convinced that they were poisonous. They weren't completely off the mark, though, for tomatoes contain solanine, a toxin which causes people to become ill. Eventually, Italians began experimenting with it and discovered that, when cooked, tomatoes were harmless and delicious. It also came to be known as an aphrodisiac. Today, there are over sixty varieties of cultivated tomatoes and hundreds more of heirloom varieties. There are so many colors, sizes, and flavors to choose from but the best, in terms of both nutrition and flavor, are vine-ripened. In order to develop the best flavor and texture, tomatoes should stay on the vine as long as possible, making home-grown tomatoes the very best quality. They are extremely versatile, too. There are so many possible ways to enjoy these gorgeous fruits (you knew the tomato was a fruit, right?). You can bake, boil, broil, fry, batter, puree, and stuff them. Use them in soups, sauces, casseroles, salsas; use them raw in salads and sandwiches. And what would pizza be without tomato sauce? Tomatoes are at their peak during summer. Store them at room temperature out of direct sunlight. If they are not yet matured, place them in a paper bag for a quick ripening. Keep them away from other fruits and vegetables—they emit ethylene gas which causes other produce to deteriorate quickly. For more fun information about tomatoes, and to learn how to grow them yourself, visit The Tomato Page at http://www.tomato.org/; New Jersey Tomato Championship Weigh-In at http://bonadeagardens.com/; and Mr. Tomato at http://www.njtomato.com/main.htm. Then try the recipes below and enjoy! In food processor combine tomatoes, scallions, jalapeno, juice of the lime, and red peppers. Process until smooth. Season with salt, pepper and a dash of Tabasco pepper sauce to taste. Chill and serve. Peeled Tomatoes Bring a large pot of water to a rolling boil. Using a paring knife make an X on the bottom of each tomato. Lower tomatoes into boiling water for 30 to 45 seconds. 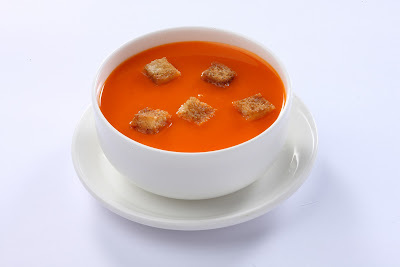 Remove tomatoes to a bowl of ice water to stop cooking process. Tomatoes can now be peeled with fingers. Quarter and seed tomatoes. Cut tomatoes into 1/4-inch dice and transfer to a bowl. Wearing rubber gloves, seed and finely chop chiles. Finely chop enough onion to measure 1/4 cup and chop cilantro. 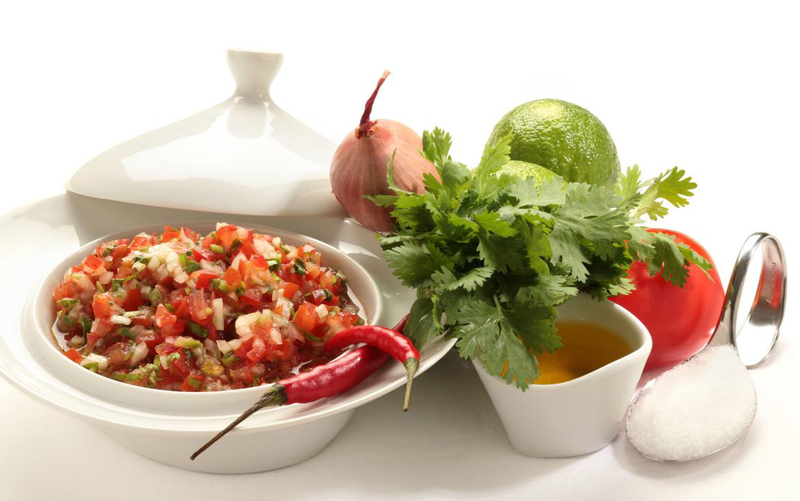 Stir chiles, onion, cilantro, and garlic into tomatoes with sugar and lime juice and salt and pepper to taste. Salsa may be made 1 hour ahead and kept at cool room temperature.